Four walls and a roof, a few windows, one or two doors — all sheds seem basically the same, right? Not exactly. The right shed lasts two decades (or more) until you’re ready to retire and move to Florida — the wrong shed falls apart two years after you built it. Shed quality and performance can differ greatly depending on where you buy your shed. The two most common places homeowners buy their sheds are from a custom shed builder like us — or from big box hardware stores. 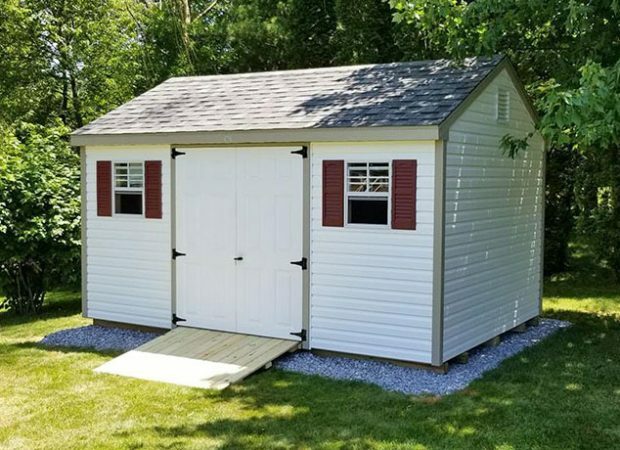 At Glick Woodworks, we’ve been in business long enough and replaced enough big box store sheds to know the difference that a truly quality shed makes. 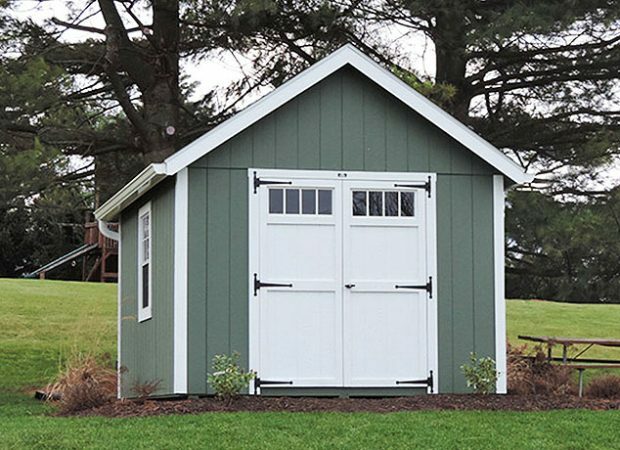 If you’re considering a hardware store shed, we have a piece of advice: you get what you pay for. For more information, check out our point-by-point shed quality breakdown! It sounds awfully convenient to just drive to the local chain hardware store and come home with the storage shed you need. If only it actually worked out that well. Mass-produced hardware store sheds lack the same quality as custom built sheds, and as a result, they don’t last. Really, you do get what you pay for — and the service and the extras are lacking, too. Glick Sheds: Shed quality starts at the siding. Since it serves the purpose of protecting your storage shed from the elements, the material needs to be tough and dependable. Glick sheds are primarily built using vinyl siding — just like most houses. Our siding alternative (painted smart side) also packs water resistance along with the unique painted style. Hardware Store Sheds: Your average hardware store shed will be built on the cheap, and the siding material makes that clear right away. The most common hardware store shed materials you’ll see are wood siding or Plastic siding. Wood siding is susceptible to mold, rot, and falling into a useless heap of timber. Plastic sheds, on the other hand, can’t handle direct sunlight and end up cracking. Either way, neither of these shed materials are up to the job. Glick Sheds: Just like home-quality vinyl is our siding material of choice, our roofing also possesses the same level of craftsmanship. To keep our shed roof quality strong enough to resist the elements, we build the roofs using architectural shingles — the same type you can find on your home. A damaged roof invites a series of nasty pests into your shed, so we make sure your shed roof is built to last. Hardware Store Sheds: Cutting corners wherever possible, low quality shed roofs often don’t feature real shingles but just a single sheet of material instead. This leaves cheap sheds more likely to leak during the wet seasons, damaging the shed itself and everything you’re storing inside. Glick Sheds: Think about lumber like the bones of your shed. It keeps your floor strong and your walls sturdy. That’s why ALL of our sheds use ultra-durable pressure treated 2×4 floor joists. This makes them structurally stronger and resistant to mold and rot. Hardware Store Sheds: Anything that adds an extra step or an extra expense, you can expect low-quality hardware store sheds to skip entirely. You’d be unlikely to find pressure-treated lumber mass produced and sold in the parking lot of a big box store. Glick Sheds: When you opt for a custom built shed, your windows are going to be good quality and installed properly. You can expect Glick shed windows to look nice and repel water while having a dependable lifespan that rivals the rest of your shed. Hardware Store Sheds: When less time and craftsmanship is put into installing windows, they are more likely to leak. This can be a serious problem as water leaks destroy your shed and what you’re storing inside. 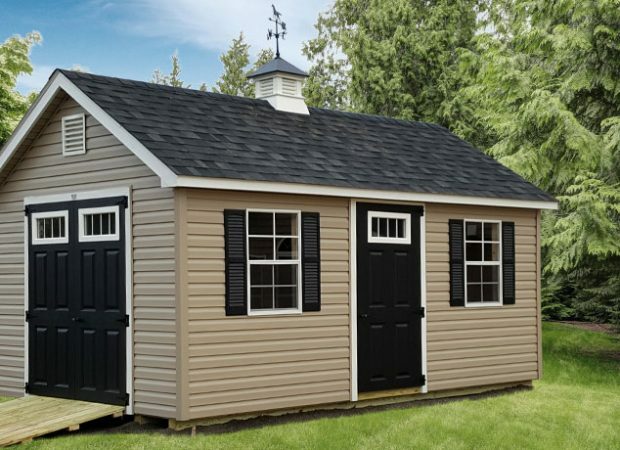 Glick Sheds: A sturdy, long-lasting shed belongs on a long-lasting foundation. At Glick Woodworks, we build and deliver stone pads which keep your shed dry from groundwater. We offer our crushed stone pads with any of our custom sheds. Hardware Store Sheds: No stone pad or anything like it. When you buy from a hardware store, you drop your shed on the ground and hope for the best. Glick Sheds: In addition to superior shed quality, we also pride ourselves on providing superior service. We deliver your new shed and remove your old one, which can save you hours of time and prevent a massive headache. Hardware Store Sheds: This differs by store, but generally big box hardware stores won’t provide the same level of service as a custom shed builder. In addition, they almost certainly won’t have the special tools to conveniently remove your old shed, so you’ll be left with DIY shed removal. Glick Sheds: Since our sheds are built custom from the ground up, we build a shed that fits your needs and your shed style. We make it our mission to design a shed that is the perfect size for what you need to store and is the perfect fit for your budget, too. Not only will your shed be better quality with Glick, but it’ll also be exactly what you need and want. While the big box hardware store might seem like a convenient place to buy a shed, you’re not investing in a long-term solution when you buy from there. At Glick Woodworks, we easily expect our custom-crafted Amish sheds to last for two decades, if not more. Getting a handful of years from your hardware store shed is about average. We build and install custom sheds year-round — contact us to discuss your storage shed needs and to get a quote. Contact Us for a FREE Storage Shed Quote! "I had an outstanding experience with Glick Woodworks. I needed a shed removed before the new one came. The young man took extra care and caution as the old shed needed to come out between the house and a tree. Fantastic job!!"